The Fiat 124 Spider takes inspiration from its glorious predecessor, the proudly all-Italian classic 1966 Spider. With its dynamic style, this is car that is designed to be a roadster and provides the ultimate unforgettable driving experience. The carefully crafted 124 Spider boasts a longitudinal engine, rear-wheel drive and low centre of gravity. It is a car that has been designed to be fun to drive with precise weight distribution producing an incredibly light platform which complements its agile and nimble handling. 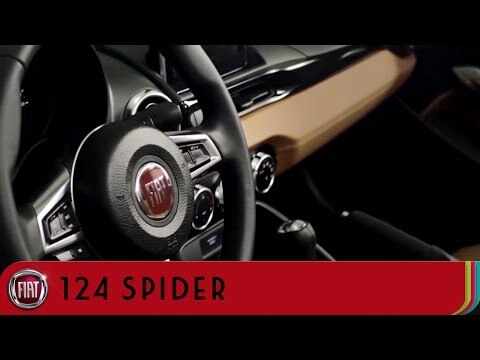 The 124 Spider’s powerful performance is produced by its 14 turbo multiair 140 Horsepower engine and manual 6-speed transmission. With outstanding weight to power ratio and 240 NM of Torque at 2,250 RPM drivers are guaranteed an emotionally thrilling performance every time they take the wheel. The interior creates a comfortable atmosphere with automatic climate control and navigation system. The 124 Spider can also be equipped with an optional 7” digital touchscreen radio, multimedia control knob and 9 Bose speakers providing the ultimate sound quality even when the roof of the car is open.